We are known for manufacturing, exporting and supplying a quality range of Chalcedony Beads, Chalcedony Briolettes, Cabochons, Druzy Stones. Without compromising on quality, we offer our range at comparatively low prices. We are amongst the most reputed names in the industry, offering Red Jasper Box Beads. We are among the prestigious names in the industry, engaged in manufacturing and exporting Labradorite Round Beads for our esteemed customers. The offered beads are rendered an optimal finish and are characterized by a precise size. We make these beads available in bulk quantities to fulfill the requirements of the customers. We are actively engaged in offering a qualitative range of Tanzanite Round Beads for catering the diversified requirements of our clients. We are providing wide assortment of Rose Quartz Round Beads Stones. All our products, through their designs and finish, exhibit a unique craftsmanship. Our exclusive designs and mesmerizing range has helped us earn a niche for ourselves in the industry and the competitive market. Kashmiri bead is made of polymer clay mixed with hardener and resin which is hand-decorated with faceted glass chips, rhinestones, glass beads, Metals, etc. Each bead is individually handcrafted. (PRICE ON REQUEST). 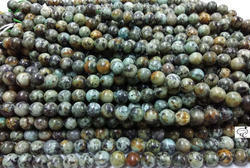 We are amongst the most reputed names in the industry, offering Rainbow Moon Stone Round Beads.